​Rivalries have been a huge part of the NBA since the league was created in 1946. The Celtics and Lakers rivalry carried the league for generations, sustaining it through multiple iterations and decades. Due to the inherently one-on-one nature of the sport itself, though, a series of individual rivalries have worked to fuel generations of youngsters in their backyards. Bird-Magic. 'Nique-Bird. Isiah-Jordan. The mano-a-mano battles that brought the game to the mainstream in the '80s live on today in all-new formats, and quite bitterly, we might add. Some of the league's biggest stars certainly seem to lock horns and hate each other these days. And we can't wait for these rivalries to continue to grow. 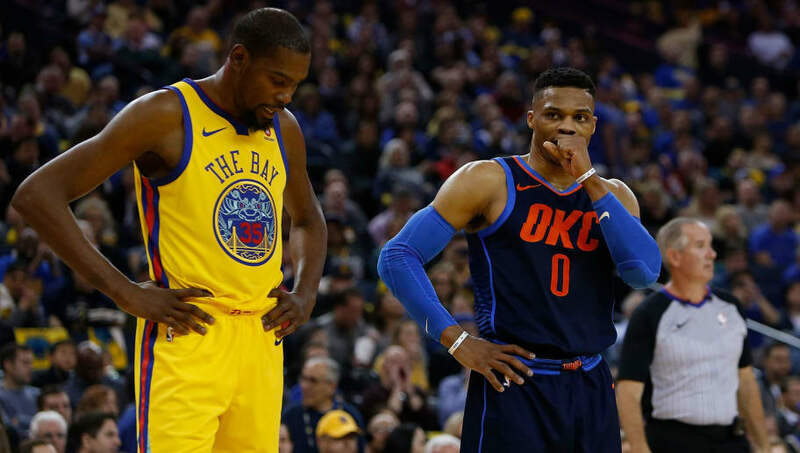 The most clear-cut feud in the league today began when Durant decided to leave his partner in crime for a better chance to win a ring with the Warriors. Since then, the Thunder and Warriors have been must-see television. The two superstars usually avoid speaking with one another prior to their matchups, but when they do, it usually involves cussing and cupcake references. This rivalry goes right down to the Cavaliers and Warriors' four consecutive meetings in the Finals. However, the battle rages on with LeBron now a Laker, even though the Warriors almost always seem to come out on top. There's no debating that the two admire each other as individuals, but when they match up on the court with their entirely disparate playing styles, that all goes out of the window. Hands down, this is the most entertaining rivalry in the league. Remember last season when Embiid took to Twitter and Instagram to post a picture of his massive dunk over Westbrook? He tagged the location "Crime Scene Investigation," further fanning the flames. The battle for Rookie of the Year last season was one of the most hostile in recent memory, with the unheralded Mitchell exploding to battle with Simmons, a "rookie" who had been drafted the previous year but missed the season with an injury. Huh. Mitchell partnered with Adidas after losing the award and created a sweatshirt with the definition of "rookie" filling the front. That definition? "An athlete, playing in his or her first season as a member of a professional sports team," a clear shot at Simmons, who missed his first year with a broken foot and had slighted Mitchell in a previous interview. The Trae Young and Luka Doncic rivalry was born when the Mavericks and Hawks made a bold swap on draft night, which sent Doncic to Dallas for Young and a top-5 protected first-rounder. Luka has clearly outplayed Trae this far, but when the Mavs and Hawks square off, you can tell that the two are playing to convince their respective franchises that they won the trade. There you have it. Keep an eye out for when these players square off against one another because there's bound to be fireworks.